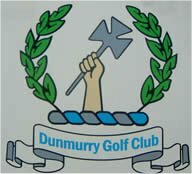 Dunmurry Golf Club Dunmurry Golf Club is situated in Co Antrim just 10 minutes drive from both Belfast City Centre to the North and the town of Lisburn to the South. The course is easily accessible to visitors, located only 5 minutes from the M1 motorway. The 18 hole (par 70) parkland course lies adjacent to the River Lagan and offers an enjoyable yet challenging test of golf for players of all standards. At Dunmurry the golfer will enjoy some of the best playing conditions in Ulster. Debate surrounds the foundation of Lisburn Golf Club. A Club was inaugurated in the town in 1880 and affiliated to the Golfing Union of Ireland. However, it had a short life going out of existence in 1885/86 The Club under its present constitution was, in fact, founded in 1905. For the next 68 years it occupied a compact nine hole course at Longstone Street in the heart if Lisburn. The present Governor's Road bisects what was the first fairway on that course. Indeed a few of the majestic lime trees which were such a feature of the course, and which hampered many a shot on the first and ninth holes, are in evidence to this day. The refurbished boutique style Temple Golf and Country Club offers great golf, sumptuous food and drink in stylish surroundings and facilities for functions, even weddings. Set in the rolling drumlins of County Down, the course has magnificent views of Slieve Croob and the Mountains of Mourne, harnessing the natural environment in order to offer challenging golf and stunning views. Edenmore has been open to the public since 1992 providing a challenging 18 hole parkland course renowned for its year round playability. Edenmore’s magnificent Country Club has a peaceful countryside setting catering for conferences, weddings, corporate golf days and for the more energetic a fully equipped health club and Spa. Located within a 30mins drive from Belfast international airport this is a unique place to escape for business and pleasure. The renowned par 71 golf course at Edenmore is a popular corporate venue and continues to develop into one of the provinces true tests of golf. Now into its second decade the course supports a thriving club and provides a warm welcome for the many visitors who tread the challenging fairways each year. The golf club has a full range of golf club equipment for sale both online and in our fully stocked proshop. At the end of a busy day there’s nothing more enjoyable than relaxing with friends in the golf club house or on the restaurant balcony overlooking the eighteenth. Edenmore provides a great base to travel from our self catering apartments to Royal golf clubs such as Royal County Down and Royal Belfast. Address: 28 Drumalig Road, Carryduff, Co. Down, BT8 8EQ. Welcome to Rockmount Golf Club an 18 hole parkland designed championship course located 8 miles south of Belfast City centre. We hope you find our website both interesting and informative and trust that should you choose to visit Rockmount you will receive a warm welcome both on and off the course. Established in April 1995 Golf Centre was the first leading superstore in the province. With over 3000 sq. feet of floor space encorporating putting green and driving bay, it lends itself to a friendly shopping atmosphere with all major brands and products on display. Highly trained staff and advisors are on hand 7 days a week to cater for all your golfing needs.